“So why on earth would you take an eight-month-old baby to a library?” my mother asked me, when I told her how Matt and I had spent the previous day with Grady. As a retired librarian who specialized in youth services, I just smiled and offered her the photographic evidence, some of which appears in the collage above. My mother understood immediately. This was Grady’s first-ever trip into the open arms of the public library. I hope there will be many, many more in the weeks and months and years to come. Knowing how much both his parents love reading, I have a sneaky suspicion my hope will almost certainly be fulfilled. Next time your mind needs a hug, head for your local library — but be warned: you might find it’s hard to leave! The little explorer! Thank you for sharing your life, Julia! You’re welcome! Thanks for sharing it with me! Hey Raynard, the temperature dropped here too – I’m worried about my begonias! I totally LOVE how books can be downloaded from the library; I check out all my audiobooks that way. A library card is the best bargain on the planet, and that’s even more true in the digital age when we can get not only books, but CDs, movies, database access, and in some libraries, even borrow software. On tax day it’s great to remember that libraries are one way we get back a great deal for what we put into the community. I agree…libraries are a necessary part of a community. We need more of them!! My mother was a librarian and the public library has always been a favorite with me too. Ann, Grady is slowly getting some hair but I miss the cute fuzzy baby head that is so fun to kiss! You are lucky to have grown up with an appreciation for the public library – a gift that keeps on giving! 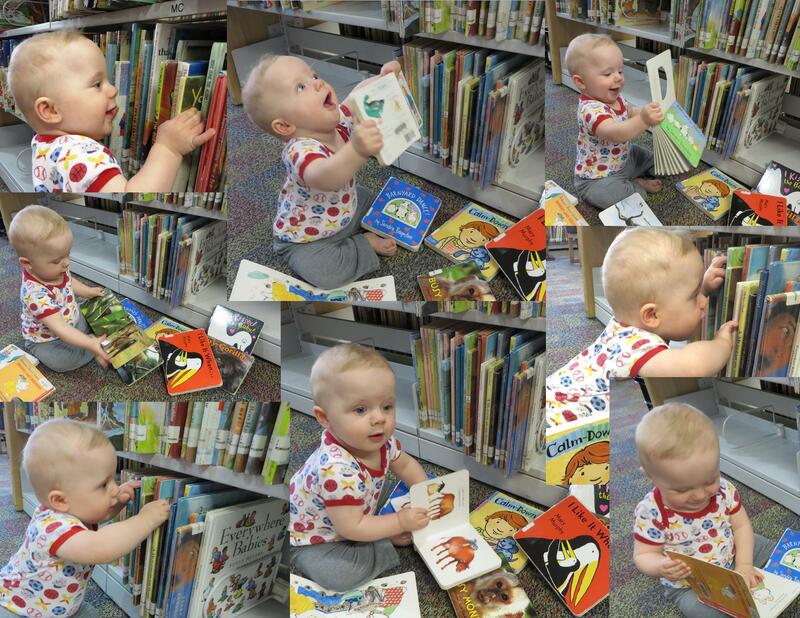 Clearly your photos show that children, even babies, can enjoy a visit to the library. Yes, they really can! And contrary to what some people might think, most libraries are eager to welcome babies. They even have programs designed just for infants. It’s never too early to start our children with good habits! This reminds me of photos of Grady with full-sized baseball and bat. The auto-pilot disconnect button was red, after all. I sat with my first born on my lap, and declared, “he’s a natural!” as he leaned forward and bit the button as if it were candy. My son was going to have the same interests that I have. Not only that, but my 3 grandsons will follow suit. Yes, as these things tend to go, it might have a reverse effect! Seriously, though, it’s like taking children to church; you can’t force them to accept it (and in fact, should not try forcing such things) but it’s important for them to learn the benefits found there. Ultimately, we all make our own choices, but we can’t choose what we don’t really know about. The good part is that libraries fit a wider range of interests than baseball or flying do – so hopefully Grady will always find something of interest there. Julia, I loved taking children to the library. I would take the four children I was watching to the library every Tuesday. They would listen to the children’s books being read and then they would get their own books to check out. They knew that Tuesday was a special day. Karen, aren’t those sweet memories? To me, nothing is more fun than taking kids to a good library and watching them explore. 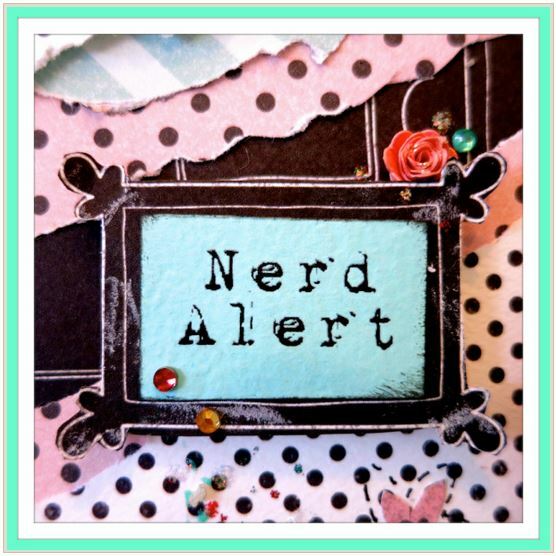 favorite blog ever! quote, photos, smiles…between that and today being grandma day (I take my 3 month daughter every weds), I’m all smiles. And she loves books! Grady is a star! Seeing how intent he is about his task to enjoy this place, it’s hard to believe this is his 1st excursion into the library! What joy emits from his face! Thank you for this pleasure! The library & I are friends. Each time I view this treasure trove of joy, I find a new favorite!!! I still think all-time fav will be the searching ones. He is diving in “knowing” there is something good waiting for him! Yes, he really surprised me with his interest in those books that were shelved. I didn’t expect him to pull up and go for them but he was after them pretty quickly and loved pulling them out. I couldn’t tell whether he was curious to see what was on front, or just likes to grab things. Probably both. Thank you, Mary Ann! I’m not surprised to learn you love the library. That goes well with being “a wind-up toy for kids.” I so appreciate your presence here and your continual encouragement! Too funny that Lynn just wrote “favorite blog ever” because I just sat down to type “favorite photo ever” before I saw that!! Absolutely fantastic! Thank you Kathy, I’m so happy you like it. I was afraid it was too busy, but there were so many photos I wanted to include (I had to leave out quite a few even with that many) and “busy” is exactly how to describe Grady that day, so I decided to go with it. Love the pictures of Grady! Such an open smiling face and so very handsome. Clearly, Grady is both an athlete and an intellectual little guy 🙂 Do you remember your first Library card? There are three libraries I hold dear. The first is the Vandalia Library close to the elementary school I attended. Second is the Adams Park library. Mom took Sharon and I after swimming lessons, and we shivered from the AC blasting frigid air. I loved the old wood floor and the smell of old books. The third was a small library in East Point within walking distance of my duplex. In the Summer instead of AC, giant pedestal fans were placed to catch any breezes from open windows. Heavenly! Wooden floors dipping at odd angles and the heady aroma of old books. The perfect place to read mystery novels. Beth, oddly enough, my first and only library card in childhood was to the College Park Public Library, on the Main Street that it shared with East Point. In fact, I think you went there with me sometimes. I never did get a card to the East Point library – I don’t know why, but perhaps the College Park library was closer to a grocery store Mom liked, or some such reason — but I envied those who did go to the East Point library. I remember it as being in a building that looked like a house, older and with much more character than plain, institutional-looking College Park library. I don’t remember you ever living in a duplex; was that after you lived on Barrow Place? What I remember most about the public library is that we were only allowed to check out five books at a time, and we only went every two weeks. I would come home and read all my books within three days and it was agony to wait for the next trip. I remember you, Joyce and I swapping library books around to fill the gaps between trips. I also checked out books from the school library, but I could only get two a week there. I’ve been making up for those stringent limits ever since. 🙂 (You don’t want to know how many active library cards I have.) When I think of books I almost always think of you! It’s not even a surprise that Grady looks perfectly enthralled surrounded by all those books. It probably is in his teeny tiny DNA 😀 I just giggle like mad to see him barefoot at the library. Look at those cute chubby widdle feet. I love all your photo’s but especially the bottom left one that has Grady carefully making a selection, HA. Oh and the top left too, with that little pinky sticking out. Very posh. Thank you for sharing your fantastic outing with us. I can’t say it enough, that is one very adorable little fellow. Thanks for being here, Barb! Hope you and your family have a great Easter. That’s weird that a link to my blogsite appeared underneath my smiley face. I did not type all that in — just the smiley. That’s OK Barb, I was happy it was on there. It was on the line beneath the smiley face. Sometimes I find when I”m typing fast, my computer pastes strange things. I thought it must have been some sort of auto signature line or something like that. As a former librarian I thoroughly enjoyed Grady exploring the “open arms” of the library. Thank you Sandra! As a youth services librarian it used to surprise me how many people didn’t realize that the library is for babies too. While I was at the public library in CA (I also worked in school libraries) I wrote a mini-grant to fund gift packages for all the new babies born in our small town, including a little board book and some info about the library programs. I always love seeing babies in the library. Thanks for your visits and comments! Good morning, Julia (at least it’s morning down under). Loved the pictures of Grady exploring books. My grandson Dexter, a year older, loves books too, although I’m sure he hasn’t been to a library. He has lots of books at home, and here when they visit, some in German as well as English (his Dad is from Stuttgart). We all love to read and as a little girl the library was such an exciting place for me. Today, I commute to the City twice a week, taking a little over an hour each way and in the Mountains we are blessed with Book Express, which brings the Library to the train station. This a great service provided by the local library, so I get to read lots, as well as having a pile of books of my own to read one day. Dorothy, I love the idea of a Book Express – what a great service! I think living in the Mountains would be so wonderful that it would be worth the commute, especially if one is able to read on the way! Perhaps Dexter will grow up speaking two languages – I wish I was fluent in more than one. Many of the kids who used to come to the library in California were totally fluent in both Spanish and English. They spoke Spanish at home but their English was so perfect you would not have guessed; they had no accent at all and were great at translating for me whenever I needed it. I came to the conclusion that kids can learn languages much more completely and easily than adults can. It’s great that Dexter has books in two languages. Darling photos of Grady. Yesterday our little one John-Michael went to story time at the Miamisburg Ohio library. And Norah is at the beach at West Palm. I feel like a second class grandparent. They also had a puppet show. He turned one in March. Is Dunwoody a suburb of Atlanta? I can’t believe how huge Atlanta is -5 million? Michael, distance and/or circumstances force many of us to feel as if we are underachievers in the grandparent thing. But the great thing is that the kids are so cute and happy we can feel sure they are getting enough love. Dunwoody is north of Atlanta, in DeKalb County. We were staying near there because Jeff needed to be near a Marta station to get to the Hinman meeting, and Dunwoody is where Megan works. She dropped Grady off with us for the day while Drew (hopefully) had some uninterrupted time to work on the classes he teaches and maybe even his dissertation. Matt and I had great fun with Grady! Atlanta is huge and spread out, like L.A. The population within the city limits is less than half a million, but the metropolitan area is about 5.5 million I think, and spreads out in pretty much all directions since it’s not located on the coast. It’s ideally situation between mountains, ocean and plains, nice places to see in any direction one drives, with the ocean relatively close by (within driving distance) to the east and to the south. And as I mentioned before, the real travel perk is having nonstop flights almost everywhere. I’ve always loved libraries, and enjoyed taking my own boys when they were young. What a delightful collection of happy photos. I hope it’s not overdone, but I had a hard time choosing which ones to use – as a grandmother I thought they were all SO CUTE. Kids are so much fun at the library. I just wrote about our own LFL today. We’re having a little dedication ceremony on May 17th. I wish you could be here with us. Alys, I have a box of books at our Alexandria home already addressed, taped up and ready to send to you for the LFL – Things I picked up at library sales for little or no money — I just haven’t gotten around to going to the post office to send it (by media mail of course) but I’ll try to get it sent so that it can be there in time for your dedication ceremony! I hope you will blog about it and then I can be there virtually. Wish I could be there in person! Julia!!!! You are such a good soul. Thank you so much for your support. Wow…a whole box of books. I’m excited. I will try to get some video and at the very least, pictures. I wish you could be here in person, too. Thank you, Julia. There are at least three LFLs in our area now, so I can always add to those. I did that with our set of Harry Potter books. I left them for a few weeks, then moved them to the all-children’s library in nearby Campbell. If they books have a vintage vibe and don’t move in the library, their is a local store that teaches art classes that would love to have them. Every book will find a good home. It should go to the bottom of your list. Thank you so much for your thoughtfulness. It looks like Grady has his parents’ and grandparents’ love of books. I would expect nothing less.Such a special time for you! Yes, that was a lovely day at the library! It was wonderful to be able to spend some time with our grandson. It is hard for me to picture a city that spread out, but the L.A. analogy does help. Someone mentioned a train book series that is very popular with the toddler set; Travis the Train or something like that. Have you heard of it? I am al little behind with the kid’s books. Michael, I’m way out of date with children’s literature, having not worked since 2003, but the only series I know of is the Thomas the Tank Engine series, which was on public television and narrated by Ringo Starr (and later, of all people, George Carlin). That was so long ago that my own sons were fans, but perhaps it’s still around as a “classic.” I have not seen 12 years a slave but I definitely want to see it, although I’d like to read the book first. I think that is it and apparently still around some. Thomas the Tank Engine series.